I've had my own shop since I was 13, and my parents gave me the old L-shaped kitchen countertop that would otherwise have gone out on the curb. I put legs on it, and from then on, I had my own corner of the basement, and did not have to contend with my father for the use (and tidyness) of his workbench. It was always a mess, but it was mine. It was no coincidence that about then my productivity and skills as a tinkerer exploded. You have to have your own place to build things. I've been working on the ideal shop ever since that day in 1966, and now that I'm sneaking up on retirement, I think I pretty much have it nailed. 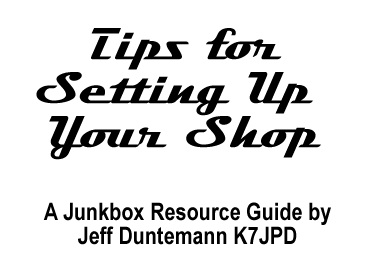 In this document I'll share some of the things I've learned in the last 40 years about how to design a place to work and how to manage your tools, instruments and...junk. The next two photos show how the benches and the west (hillside) end of the shop looked when it was built in March 2004, and then the same view more recently in May, 2007. The third photo is the view from the west end looking toward the east end, with the exterior door. I stood on the west end bench to take it. I've had the shop for three years now, but shops are works in progress and there's a great deal more in my notebooks still to be done. Next to having lots of walls, the most important thing in a shop is having lots of light. All my life I've had workshops in basements, and often tried to make do with a single bulb in the ceiling, or one junky gooseneck lamp on a shelf. Not this time. Across the ceiling of my new shop are six four-tube fluorescent fixtures in three banks, each bank controllable from its own switch. So I can illuminate each end or the middle separately, or all at once. When those fixtures are all buzzing, man, it's bright as day down there! The contractor put in four ordinary incandescent bulb sockets between the fluorescent fixtures, controllable by yet another switch. I was puzzled at first, but this is routinely done in new construction of spaces designated as "shops" (as mine was) and lit solely by fluorescent light fixtures: The incandescent bulbs "fill in" between the rapidly flickering pulses of light from the 4' long tubes, which makes the light in the shop easier on the eyes, less likely to cause headaches, and less likely to stroboscopically "stop" a rapidly rotating device like a fan or a power tool blade and make it appear to be standing still. The incandescents also make the light in the shop a little "warmer," which is good for us geeks who don't go out in the sun as much as we should, heh. One critical issue that a lot of guys don't think much about is how high your work surfaces should be. I took mental notes while building a project years ago, and determined that building a chassis-based radio involves both close-up, sit-in-one-place work and run-around-the-shop work, primarily picking parts and doing chassis metalwork. I also realized (though it should be obvious) that a tall bench can work well for both sit-down and stand-up work (get a tall stool!) but a short bench is useless for stand-up work. In other words, a workbench is not a desk. Go tall. How tall depends to some extent on how tall you are. The rule of thumb I've used in my last two shops works well for me: Your bench surface should be as high as the top of your belt. For me, that's 40 inches. I'm 5' 8" tall in my socks, and wear shoes that add another inch to my height. In truth, you've got some wiggle room, and a couple of my friends have told me my bench seems high, and they would go for 38" or so. If you can't decide, find a piece of plywood and somehow prop it up to various heights, and see how well your arms and hands "like" a particular height. As for the depth of the bench, that depends on your arms. You want to be able to reach across the bench to the wall (where all the power outlets are) without bruising your ribs on the front edge of the bench. For me, that's 33" and no more. My short bench is deeper by design, but is intended for work that doesn't require electricity. 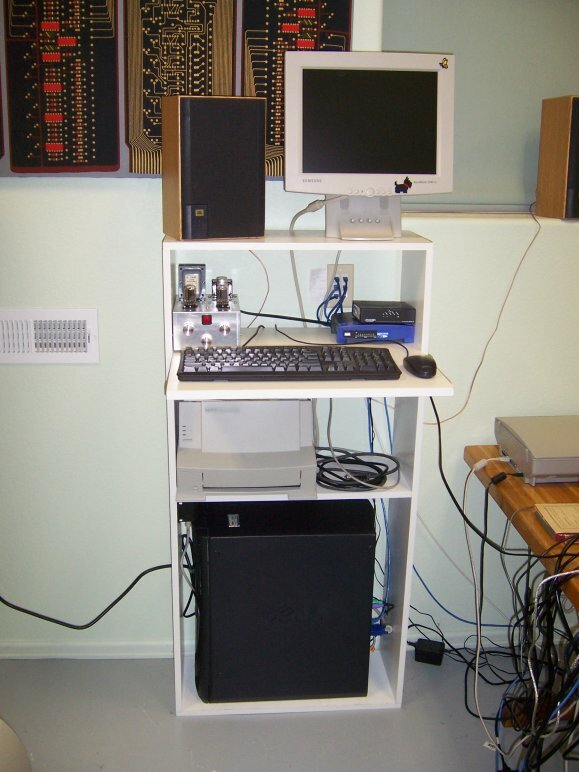 I use an old bar stool for sitting at the test bench. It's 28" high to the top of the cushion, and that's just about perfect for me. I bought a second stool for my ham radio operating position, and at 30" high it's a little too tall. I have to (carefully) cut about 2" off the legs before it will serve well. Inches matter! 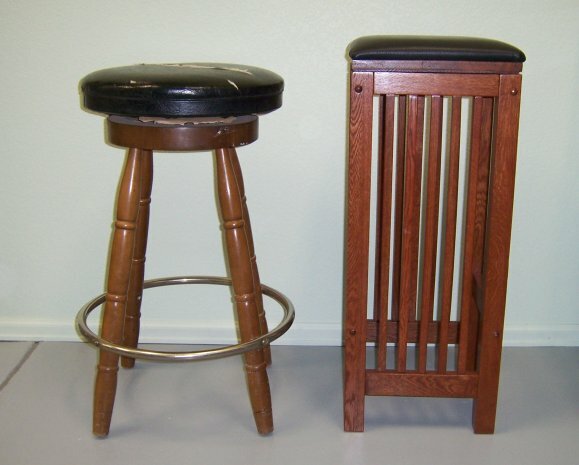 One other note: Don't get a tall stool that rolls. They exist, but again, you're not at a desk. You want a seat that doesn't move around. With a rolling stool, you will have a terrible time keeping your body steady while your hands try to hold soldering irons or small parts. Action begets reaction, and you will find yourself drifting around in front of the bench and flubbing small tasks that require steady hands and an unmoving body. Warning: Do not use hollow core doors or Lauan doors as bench tops. They're not strong enough and will literally buckle and collapse under the weight of too much stuff! I recommend doing it right and framing with 2 X 4 studs underneath, with supports for the bench top every six feet or so. Use 3/4" plywood for the bench tops themselves. Support the bench top on all four sides. Sand, seal, and paint the bench so that if you spill PCB etchant it will not soak into the wood and reek for the next 30 years. Rule of thumb: The bench should not flex when you sit on it, assuming you weigh at least 150 pounds. I went overboard with my current benches (which are framed with 4 X 4s and will hold at least a ton without suffering) but better to have the strength and not need it than need it and not have it. 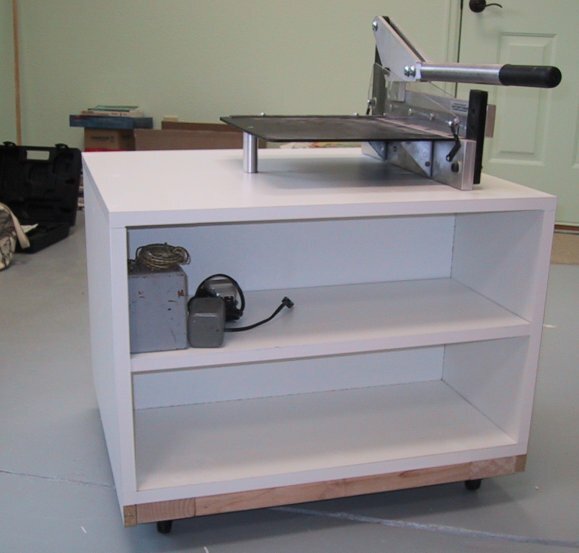 An electronics test bench doesn't typically carry a lot of weight, but you want the option to add bench tools (drill press, small bandsaw, sandblasting cabinet, etc.) if you need them later on. 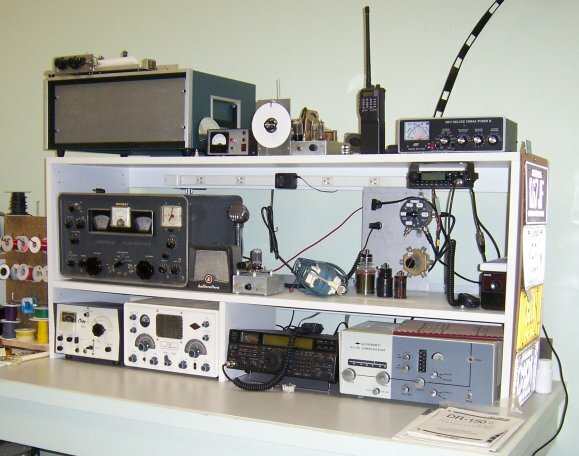 Below is my solder station and test bench as it exists today. The gear you see (not counting the drill press) probably weighs a little over a hundred pounds all together, most of that in the three old-school transformer-heavy power supplies on the bench toward the left of the photo. If you're going to work in electronics, you're going to need electricity. Duhh. Actually, you're going to have a whole wall full of gadgets, all of which need their own place at the electron trough. On my bench I have (at last count) thirty-three separate devices with 110V cords. Fortunately, I don't need all of them on at onceand if I did, I'd need fifty amp service, which I don't have in that part of the house. 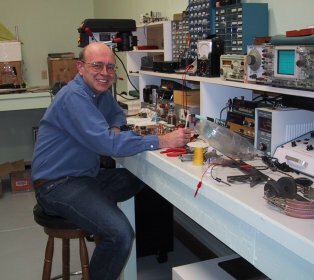 What I do have is dedicated 30 amp service to a 16-foot-long "plugmold" strip on the wall just above the benchtop. The plugmold has its own breaker in the service box, and an outlet every twelve inches, for a total of fifteen outlets. 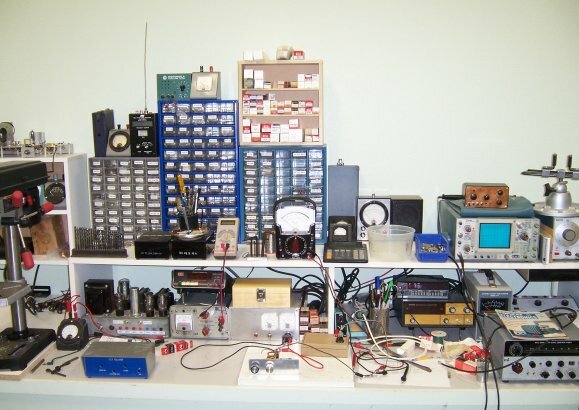 Everything that I use regularly is plugged into the plugmold: Soldering station, oscilloscope, signal generator, high-voltage DC supply, 12V DC supply, audio generator, frequency counter, drill press, belt sander, and Dremel tool. My ham station is housed on a separate Melamine particle board shelf unit that itself has two short plugmolds, one for each shelf. The whole station is plugged into one outlet on the master plugmold. This works well because the way I operate, I rarely have more than one radio turned on at a time, except for the modern 2M mobile, which is on squelch most of the time and draws very little power. I deliberately did not put a plugmold on the wall behind my short bench, because it has a sink and I did not intend to use it for electrical work. There are outlets on the wall, but they are all GFI equipped, as they must be to pass code. I didn't put 220V in the shop, because I really don't use anything big enough to require it down there. I have 220V in the garage for my lathe, and that's the only thing I've ever had that needs that kind of power. 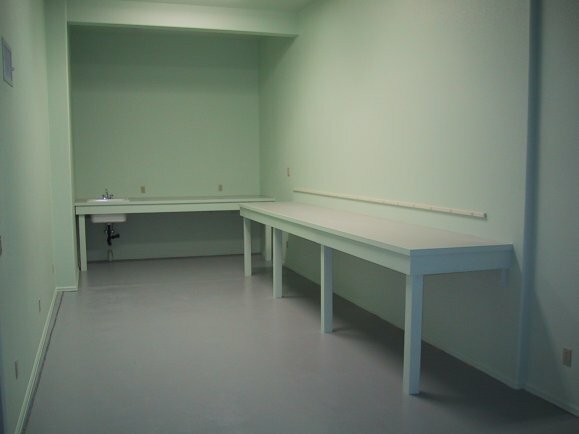 If you're a computer guy designing a shop, consider putting network cabling in, at least so that you can have a small computer or laptop somewhere to look things up on the Web when you need them. I arranged it so that the terminus of all the CAT5E running throuough the house is in the shop, along with my cable modem. I built a Melamine board shelf to hold cable modem, router, and a spare computer, as well as my homebrew vacuum-tube stereo amplifier. A phone jack near your bench is also very handy. For the sake of my ham radio station I ran 1/4" soft copper ground wire to where my cold water pipe enters the foundation. Guys used to run intercoms to their shops so their spouses could yell for them without getting hoarse. Useful and maybe cool in its way (especially if you build the intercom yourself with a tube amplifier) but these days Carol just calls me from upstairs on my cell. 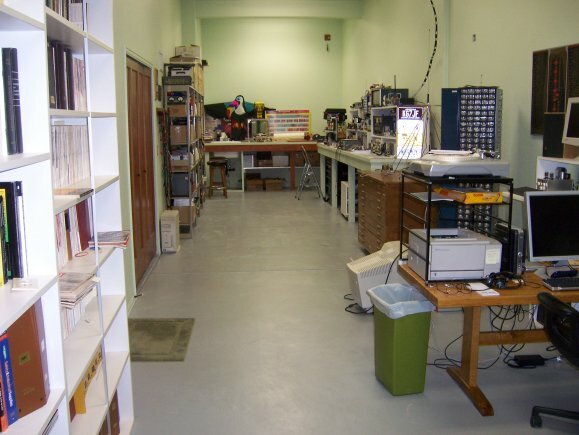 Shops are often built in "non-living" space like garages and basements, and when the weather outside gets bad it can get so miserable in the shop that you can't work. Electronics requires happy hands, and if they're so cold they're stiff you won't get much done. Make sure you provide your shop with at least a modicum of climate control. In a basement this may require a little extra ductwork to bring heated air to your corner. In a garage it may require a standalone gas or electric heater. 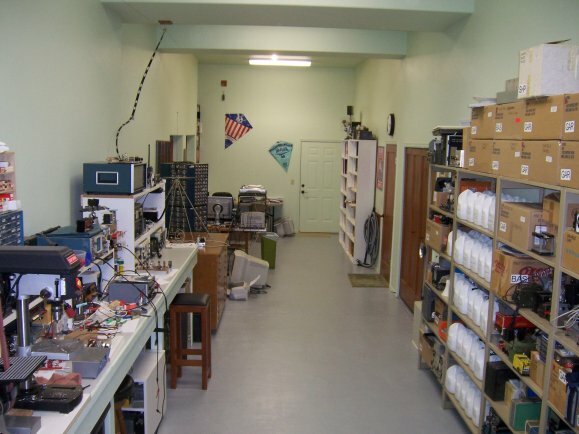 I now live in Colorado at 6,500 feet, but when I built my custom shop in Scottsdale, Arizona back in 1995, the big problem was not heating but cooling. Most garages are not especially well insulated, but I put R-30 in the walls and ceiling, and never regretted the additional expenseespecially when it hit 115° outside! The building (which was nominally a garage but never had a car in it) had its own heat pump, which was capable of both heating and cooling. In the nine years I had the shop, however, I remember turning the unit to "heat" maybe four or five times. Ventilation is also something to think about. Electronics work and other tinkerer obsessions occasionally require the use of smelly stuff like paints and solvents or printed circuit board etchant. This can be a problem in basements. In a garage you can (in decent weather) raise the big door. If possible, place your bench near openable windows. Also consider your family: When I designed my current shop, I included a door to separate the shop from the rest of the house specifically to keep sounds and smells from driving Carol to distraction. A lockable door may also be desirable if you have small children around. 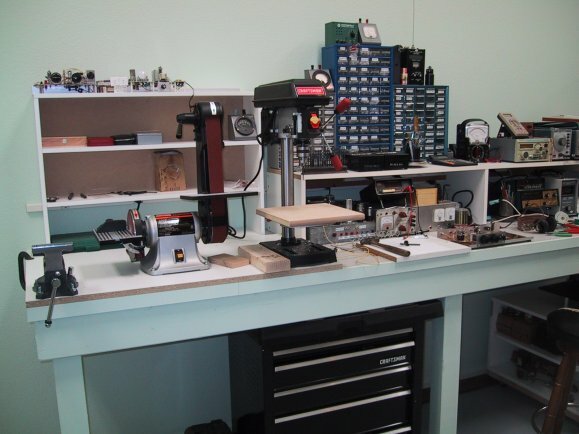 For years, I had my electronics bench in the basement and my metalworking tools in the garage on a separate bench. I found that I was chasing between basement and garage every time I needed to drill a hole in something metal, which was often. Now, I still keep my metal lathe in the garage (there was no way to get it down the hill into my lower-level shop) but I find that a drill press is so completely indispensible to electronics work that I bought a second (smaller) one at Sears and put it right on my test bench, only a couple of feet from my solder station. Small drill presses are cheap these days (I paid well under $100 for this small one) and you don't need a huge unit for chassis and PCB work, so if you have a press in the garage or somewhere else, get a second one for your electronics bench. I also have a vise for bench metal work and a stationary belt sander there. With those three tools a few steps from my solder station, I find myself runnintg upstairs to the garage a lot less often. Make sure you clean up the metal chips now and then, or they will get into places they shouldn't, and be dragged into the rest of the house on your shoes. I have an outlet for the house's central vacuum system in my shop, with its own hose, and that has been a major blessing when I'm making heavy use of the drill press, belt sander, and Dremel tool. After even a few years as a tinkerer (and not 40-odd years like me) you will accumulate an immense amount of parts, tools, and related stuff. The kind of electronics that I often do involves parts that can't be easily found, so when I find them, I hoard them. (You just can't buy Compactron tube sockets at Radio Shack anymore.) 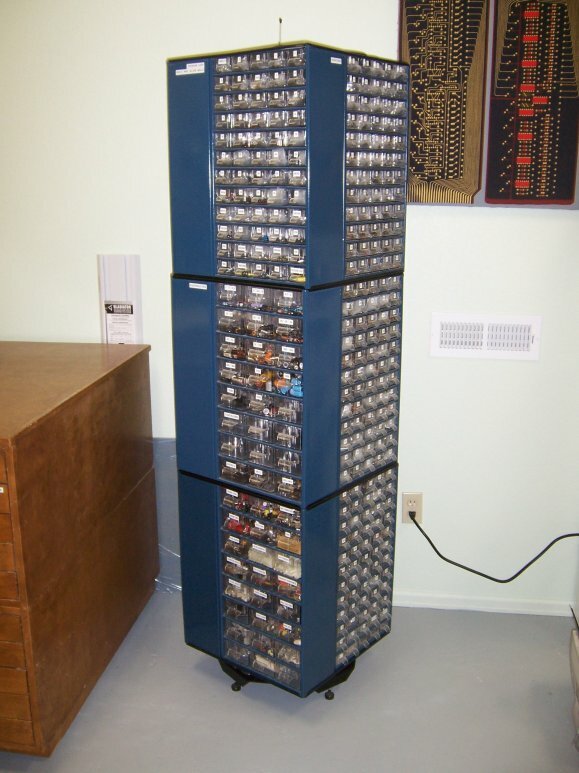 A related problem is that electronic parts come in a near-infinite number of non-interchangeable varieties. Resistors have resistance and power values. Capacitors have capacitance values and other parameters making them suitable for one kind of device or another. (For me, it works out to RF-friendly vs. non-RF friendly.) Zeroing in on a particular part can take a great deal of time if all your resistors are loose in one big bin. That's why I think it makes sense to spend money and effort on parts and tool storage that allows you to zero in on precisely the part or tool you need in a matter of seconds. This section explains how I've done that. I still intend to divide the top drawer into several compartments so that screwdrivers, pliers, nut drivers, and miscellany will all be grouped together and not force me to dig so much. I've been gathering electronics parts since I was 11 and would raid the local curbs on Garbage Day to gather dead radios and TV sets to cannibalize. Managing over 40 years of scavenged parts is a challenge. 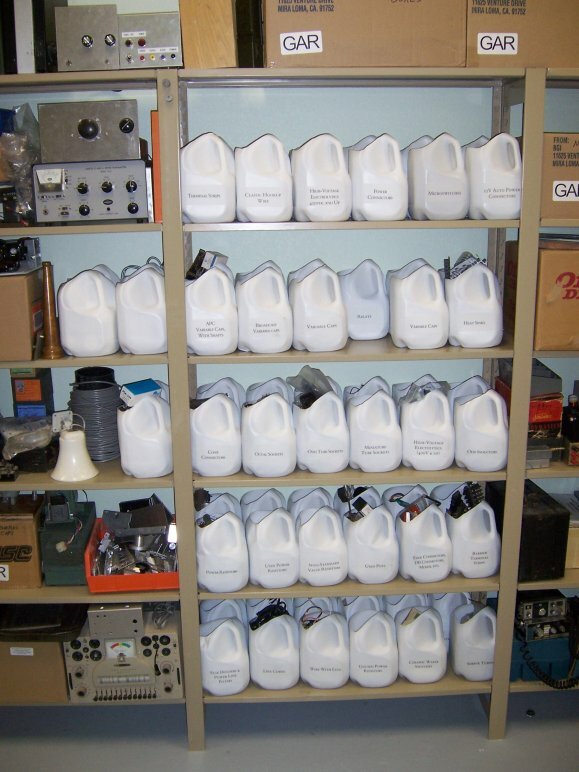 I've tried a lot of things, but what I stuck with I've been doing for 35 years: Storing parts in plastic milk jugs. This works best for parts the size of tube sockets, knobs, or relays rather than carbon resistors or small caps. Gallon milk jugs fit two deep on the shelves that I have, and I have 60 of them in only four feet of linear wall space. In the mid-1990s, particle board coated with white Melamine laminate became common and cheap at home improvement stores. Once I discovered it I fell in love. It's strong, rugged, reasonably easy to work with, and looks good without paint. 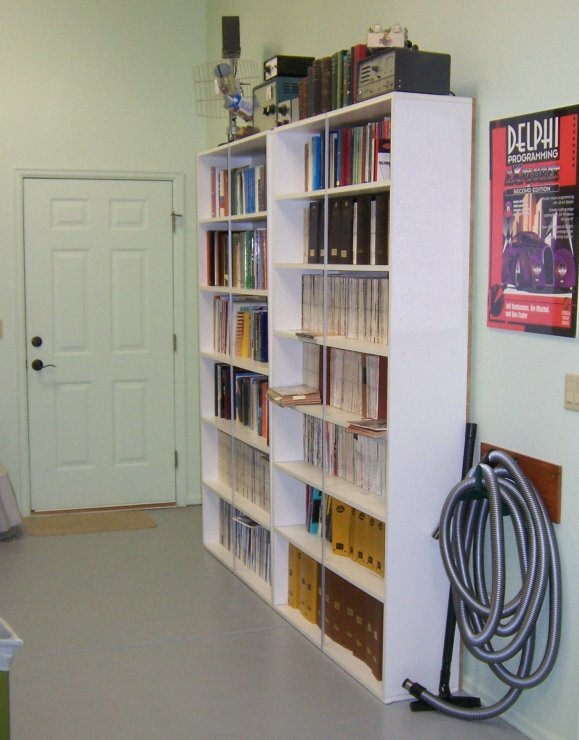 When I built my Scottsdale custom shop in 1995, I built two very large bookshelves and a number of smaller shelf units out of Melamine board, and took everything with me when we moved to Colorado in 2003. That's when I realized the big downside to particle board construction: It's heavy. However, I wasn't doing the lugging myself, and much younger backs put all the items where they had to go. Keep that in mind: If you build (as I did) a couple of 4' X 8' particle board shelves in the middle of your shop, get some help to place them where they belong. The ones shown above each weighs more than 125 pounds! Here's a trick that may help: Design your shelves so that you can get the Melamine board cut at the store. Home Depot and Lowe's both do this, though they often charge a per-cut fee. However, they have huge saws that cut a very straight line, and the resulting pieces mate cleanly without any cracks. They certainly do better than you'll ever do with a freehand circular saw. I made a nice little rolling shelf-table for my sheet metal shear that required just a few cuts, all but one of which was done at Home Depot. The unit is extremely strong, and serves two purposes: It support my shear and also stores power transformers. It's on casters, and rolls under my bench when I don't need it. Building with Melamine board almost requires the use of deck screws and a strong cordless drill. Drill pilot holes through the outer member and countersink them. Clamp the pieces at the corners and then drive the deck screws home. There is white filler putty that will fill the screw holes and make them difficult to see from more than a few feet away. There's another neat trick Melamine offers you that will make your shelves even prettier: You can buy iron-on edging strip in rolls. Buy a cheap steam iron at a garage sale and use it for nothing else. (Do not borrow your wife's!) Carol gave me her old one that leaked, and since I didn't need steam it's been in my tool drawer ever since. There is a glue layer on the back of the strip that melts when you apply the iron to the front of the strip. Practice with the iron and some scrap board until you get the knack of it; if it goes on crooked you'll have to pry the strip off with a wood chisel and start over. If you must cut Melamine particle board yourself (or any kind of particle board) get a saw blade with carbide teeth. Particle board is very dense and will kill a plain steel saw blade in no time flat. One caution: Melamine board isn't very "springy" and will go swayback on you if you put a heavy load in the middle between the supporting ends. I placed a length of 3/8" aluminum U-channel down the front face of the two big bookshelves shown above, and screwed the back edges of the shelves to sheets of 3/4 Melamine board forming the backs of the units. Under the weight of many years of QST (second in magazine-mass only to old National Geographics) the shelves have still bowed a little. You can see the same thing on my ham station shelf: The top is very slightly bowed, even though there has never been anything really heavy on it. (The blue equipment cabinet at top left is empty and is just there to get it out of the way.) Note that I inserted a Melamine board vertical support under the old Hammarlund receiver, which truly deserves the term "boatanchor" even though I love it and will never give it up. The Gonset and Clegg radios at the bottom are just too heavy for shelves and will always remain on the benchtop itself. I also use a 12" X 14" piece of scrap Melamine board as a "solder platform" on which I build PC boards and chassis. 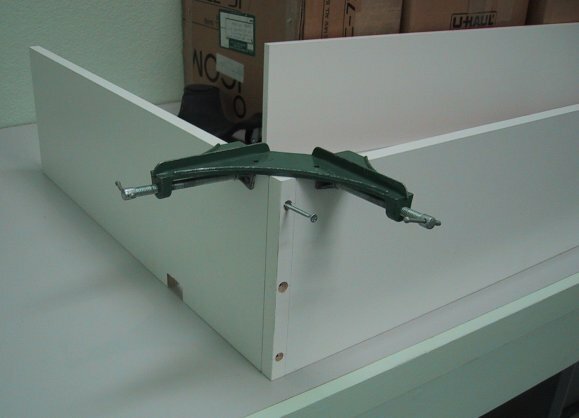 It protects the bench top from scorches and scratches from tools. When the piece of board gets too unsightly, just cut another. 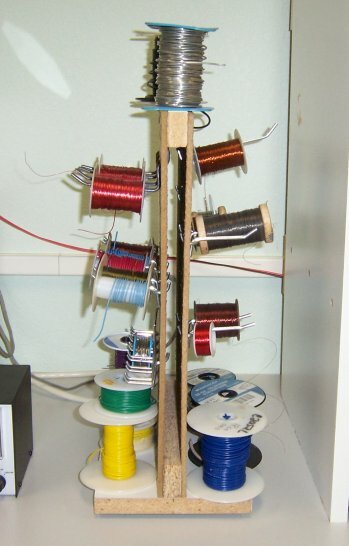 Build a Rotating "Wire Tower"
If you work in electronics, you have to deal with wire. Lots of wire. 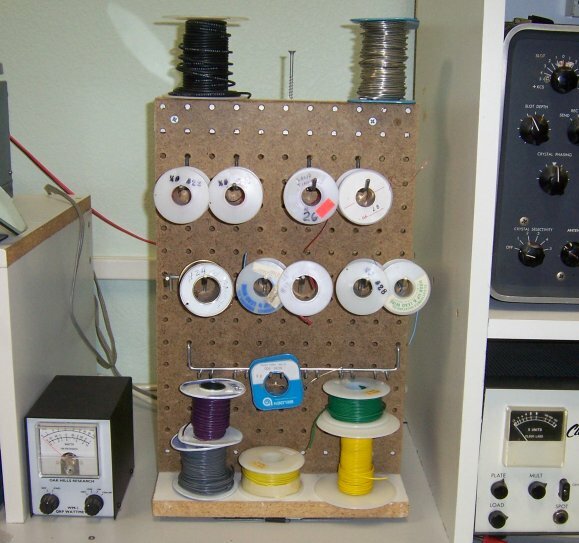 If you're going to build radios or other equipment that operates at RF, you will need lots of kinds of wire: Bare tinned "bus wire," tinned hookup wire, and many sizes of enameled "magnet wire" which is not often used for magnets but is essential for winding RF coils. At some point you'll end up with a ratty cardboard box full of spools, all of different sizes, and (predictably; this must be Somebody's Law) you'll have to dig all the way to the bottom of the bin to find the spool you want. It's all scrap: A base of Melamine-coated particle board, two pieces of 1/4" hard-surfaced Masonite pegboard, and a few screws. The device is 10 3/4" wide and 18" tall. The lazy susan bearing is 6" square. The dimensions were actually dictated by a piece of scrap particle board that I had in the corner, and it's actually a little smaller than I might have placed in that space. The hooks on which the spools are placed were from a selection of generic pegboard hooks purchased in a bag from Home Depot years ago. Another note on spool wire: Mark the spools with a permanent marker as to the wire gauge, especially if they're labeled with adhesive labels that may be smudged out of legibility by your sweaty fingers. Determining wire gauge by measuring the wire is a tricky business and difficult to do accurately. It was about $350 in 1990. The tower has moved twice, and I'm astonished at how much time it has saved me by allowing me to zero in on precisely what I want without digging in larger, more random assortments. It's also extremely compact for something that holds so many parts. Alas, the firm that I ordered it from, Turnkey, is no longer in business and I haven't seen anything similar for sale elsewhere. If you know where something like this can be had, do let me know, and I'll link to it here! 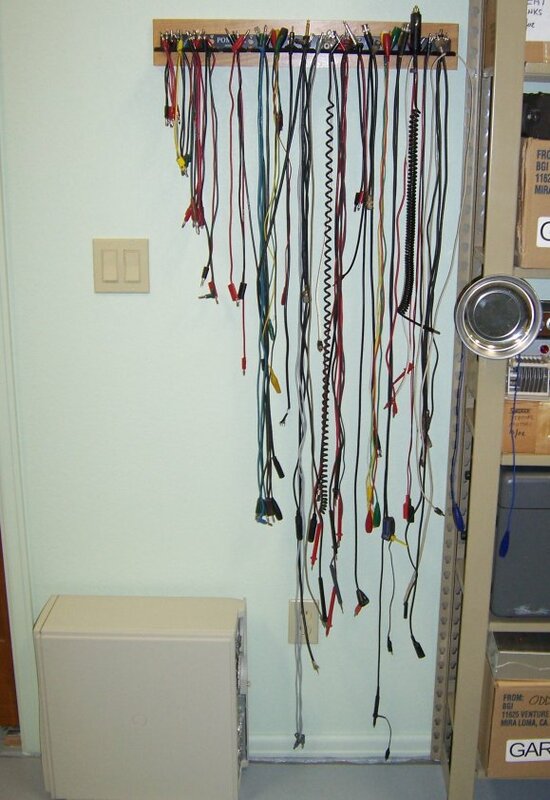 Electronics is difficult without test leads and jumper cables, and over time you will accumulate a box full of them. Then problem is that they get tangled up if you keep them in a cardboard box, as I did until just a few years ago. When you dig around in the box, the cables get tangled up in knots almost by magic, and if you pull too hard on one end of a cable to get it out of the ratsnest, you can loosen the connectors on the ends. Rig yourself some kind of cable rack. I bought a couple of Pomona aluminum cable racks at a hamfest and although I still have a box with (tangled) cables in it, the cables I use the most are hanging on the rack and are instantly findable and grabable. However, you can get the same results with a piece of aluminum angle bracket and a nibbling tool to cut notches along its length. 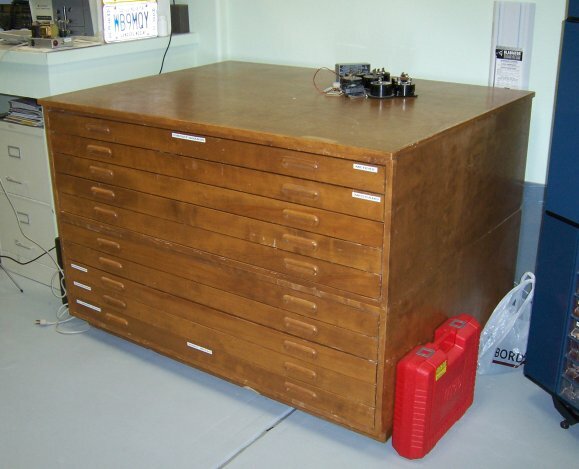 One thing I came upon almost by accident was a wooden "flats cabinet." These were very common at one point in the graphics arts industry, and are designed for holding "pasteups" of typeset text and images before and after being statted for reproduction. Some people call them "map cabinets" and they work well for anything big and flat like maps, posters, and so on. I keep Hi-Flier kites in one drawer, foamcore, cardboard, and PC board stock in another drawer. My Meccano set takes two drawers all by itself, with the parts all placed in shallow plastic bins that I ordered (as with my parts tower) from defunct industrial supply house Turnkey. The top drawer has PC board lashups and panel meters. The one I have actually came from Coriolis Group Books, the publishing company I operated in the 1990s. We began in 1989 still doing conventional pasteups, but by 1994 or so we were doing everything digitally, and the cabinet simply gathered junk. When we moved the office in 1996 I just took it home. It's in two sections, each having five drawers. The two sections bolt together, and the whole thing rides on casters. You can find flats cabinets at used furniture stores from time to time and they're worth looking for. I see them on eBay regularly, but because they're so bulky and heavy they're generally listed as "pickup only" or cost almost as much to ship as to buy! Something to keep in mind as you plan parts and tool storage: You use some stuff a lot, some stuff much more rarely, and some stuff...well, after you're gone your kids will put it on eBay or out on the curb. I have a legendary hoard of vacuum tubes, but I've learned that only a handful of tube types are really useful. So I keep a few tubes that I know I will use on a small shelf near my soldering station (6T9s, 3V4s, 12AX7s, 6AG7s, 6L6s, you old guys know what I mean) and leave the others in boxes in the closet. If I really need an 829B I know where they live but I'm not always tripping over them. There are odd boxes in odd places with other things that I rarely use: 1% resistors, O-rings, big hose clamps, my father-in-law's wire recorder, old homebrew lashups, the keyboard from a PCjr, and so on. Why some of it remains with me I'm not sure, but I've managed to prioritize storage to the extent that I rarely have to go digging, and that's the ideal you should shoot for. Also, tidyness is more than an aesthetic value. If you never put anything away, sooner or later you will lose track of stuff and constantly be wasting time hunting for it. (Trust me, I've been there. More than once.) If it's not where it belongs, you may even forget you had it and buy another needlessly. So strive to put things away when you finish a project, and occasionally even while a project is underway. Projects cause workbench entropy, which must be beaten back periodically or all your careful storage planning is for nothing! I keep a 6' fiberglass ladder in the shop (it hangs on tubing hooks right behind the door) as well as a stepstool allowing me access to the top of my various shelves. Falls kill; be careful when you have to go high. Although I hope they carry me out of here in my late 90s, you young folks may still be on a career path that requires uprooting periodically. I chased promotions and moved every few years in the 70s and 80s, and getting some of my stuff out of the basement proved so difficult that I either tore it down and threw it out or left it there. Plan your shop so that if you have to move, you can get everything out and onto a truck. That's it for the moment. Let me know if you've learned anything about setting up an effective shop that I haven't mentioned here, and I'll add it for the benefit of those who are just getting underway. Ideas? Comments? Errors? Contact me and let me know!